If you are a regular reader of my blog, you will no doubt know by now that I love the rain. There's something about the rain that makes me feel so relaxed, so free and so at peace. 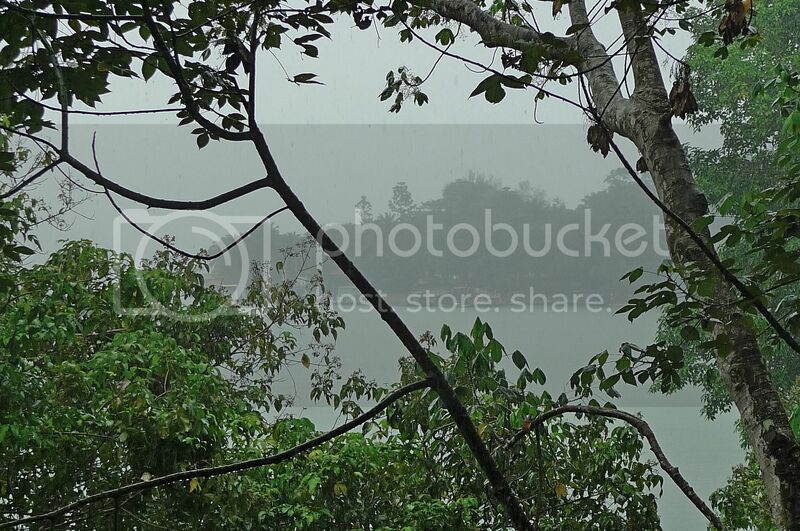 And so it must have been a great blessing to me that afternoon when it began to rain at Lake Kenyir. The timing of the rain could not have been more perfect! My friend and I had just returned from our bird watching trip and we had enjoyed a scenic walk along Lake Kenyir from Pengkalan Gawi. We were lucky it didn't rain sooner or we would have gotten all wet! 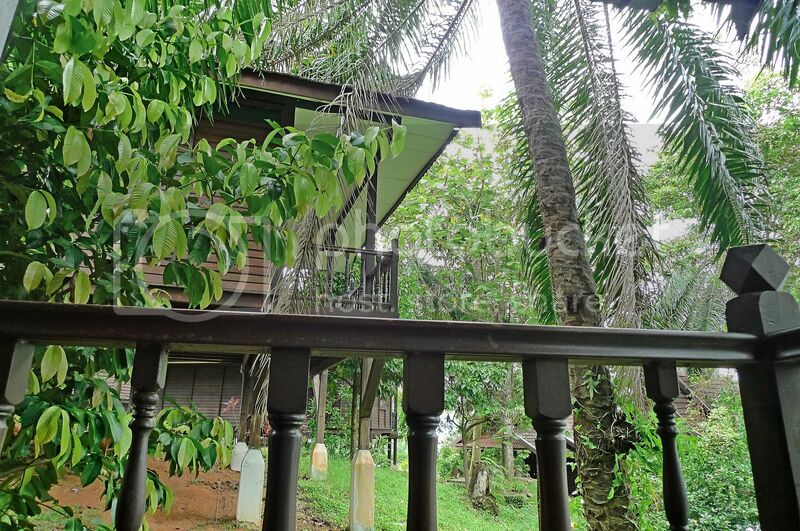 Once we returned to our comfortable chalet, I called up the Ulik Mayang Spa to book for our massage. I had thought of going for the massage before we go for lunch, but unfortunately, they could only schedule our massage at 2pm, which was about 2 hours later. I was not really hungry so we decided to rest for a while after all that walking in the morning. 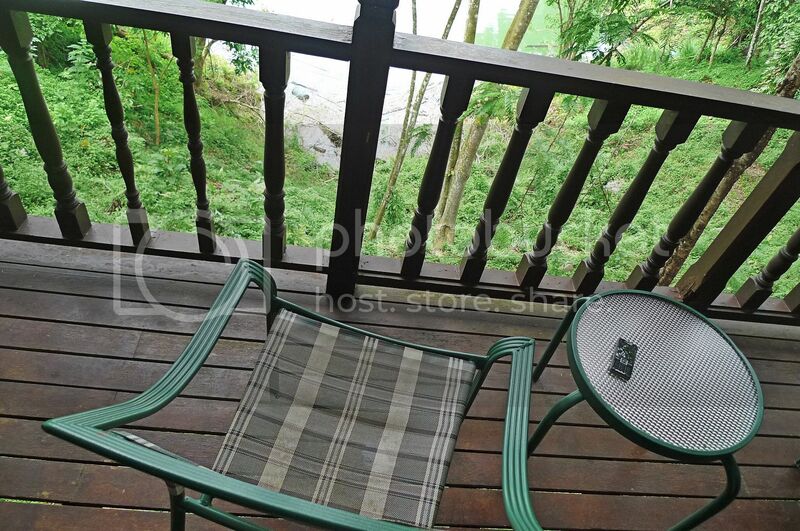 I thought it would be nice to just relax at the balcony overlooking the lovely lake! I wished I had brought along a book to read! My friend was obviously immersed in his book as you can see from this photo below. And then, all of a sudden, the skies opened up and it began to pour! Hooray! My friend went inside to bed for a short nap. I could not blame him. We woke up at 6.15am that morning remember? As for me, how could I miss the rain? Although I must admit it's nice to be sleeping in bed while it's raining outside! I decided to sit there by the balcony and just enjoy the rain. Thank God for the rain! Yes, those are my legs and trust me, you will get to see more of them in my upcoming posts, haha! No words can describe my happiness sitting there looking at the rain and feeling the wind blowing and listening to the sound of the rain falling. It's so relaxing I could feel myself dozing off. Of course, before dozing off, I made sure I took some photos of the rain! And for those of you who followed me on Twitter, you would probably remember I tweeted about the rain in Kenyir. Read it here. While my friend slept, I was practically tweeting away on my handphone. Haha! I didn't really need a book, I just need my handphone. LOL! 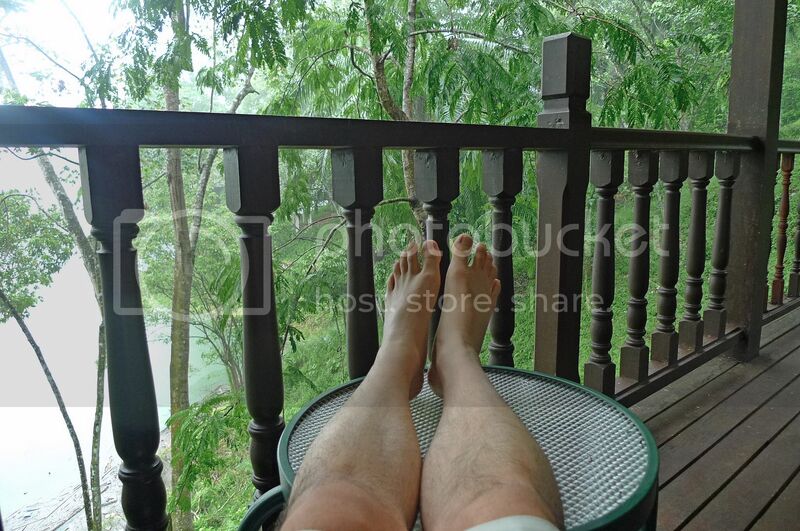 OK, in case you are wondering why there are two almost similar pictures here, well, the above picture focuses on my legs and the picture below focuses on my handphone. Haha! I did doze for a little while and before I knew it, the rain had stopped and two hours had flew past. I really missed that rain but I guess all good things must come to an end. It was time to wake my friend up. I did not want to be late for our massage! So how's the horse-kill-chicken (massage)[ma-sak-chi]? coming up next post? So I heard that in Asian countries, it can rain instantly and then it goes away as quickly as it comes. That's pretty interesting, can't really imagine how it feels like to be walking on a sunny day and all of a sudden, the sky pours. I was told it's very common in Asian countries. I love the rain too but the rain in San Francisco is typically fierce and windy. In other words, you're almost guaranteed to get sick if you walk in SF's rain. We all love the rain (minus the legs).. Haha.. Rain is good. Especially when it's hot. But not when it's time to leave the office. Can cause havoc on the roads. i don't like rain, i seems like very gloomy to me.. instead i love sunshine day, more energetic and vibrant!! cheahs@n, I love the rain when in the home too! Definitely not when trapped in a traffic jam! daniel, sorry about the legs, but more legs coming up! Haha! mei teng, show my face? No way! The best I can show are my legs, hehe. SK, so you are a sunshine person, eh? Well, I like sunshine too but I also like the rain. I adapt easily, haha. Want to see my face? Meet up with me. Since I treasure my privacy, my face is not allowed on my blog. Meantime, the best I can do is show my hairy legs, haha! merryn, haha! Of course I checked whether can see my reflection there first before putting it on my blog, what do you expect! LOL! You only sign up for Twitter recently, but you're already hooked on to it. 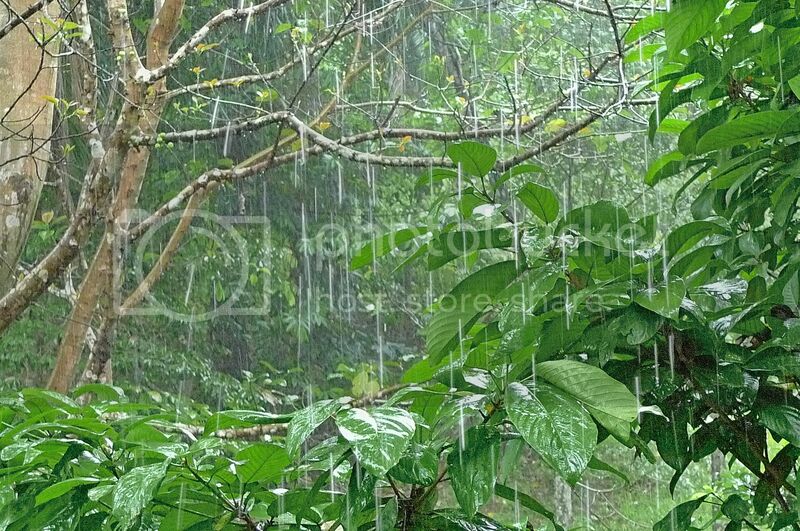 Yeah I also love the rain but I don't like the rain in city....The streets become muddy and the crowd in the city...yuck...I love rain in my village where there is greenery and I can happily watch it from my window. 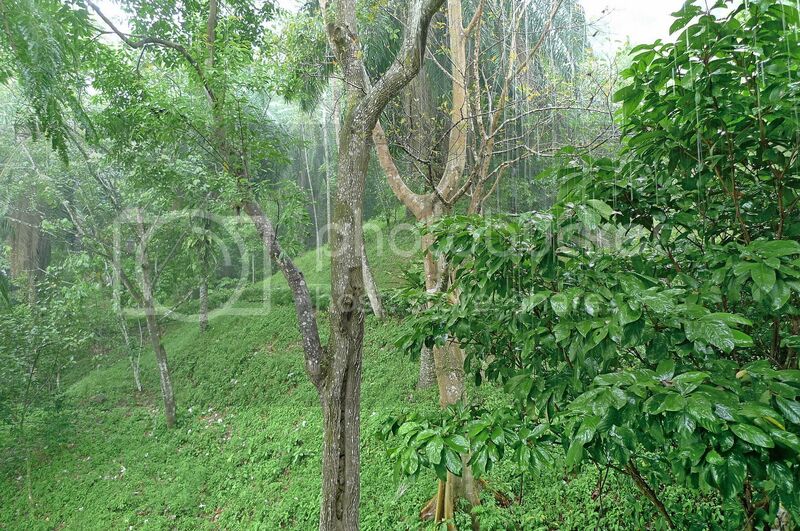 damn, i love rain and this place is totally awesome bro! a good place to read a book too. maybe i can take 7 hours for 700 pages? man! I don't know, Foong, on a holiday, I don't think I like it raining. I feel it's a waste of time having to stay indoors. Basically, I'm a sunshine girl. Taking a nap on a holiday is also a time-waster to me. I might as well sleep at home. Oh well, you didn't have a choice, I guess. Btw, nice pictures of the rain. Can't remember when I was drenched in the rain though we get plenty here!Still, good to be indoors. i would prefer to see yr face that legs! hehe..
bananaz, haha! I did not know about Avatar at that time. The trunks are supposed to add interest to the picture, LOL! lydd, well a cup of coffee sure makes it even more enjoyable! Haha! wenn, I know! Everyone is saying that, but I think I can only show my legs, haha! lina, not this time, haha! 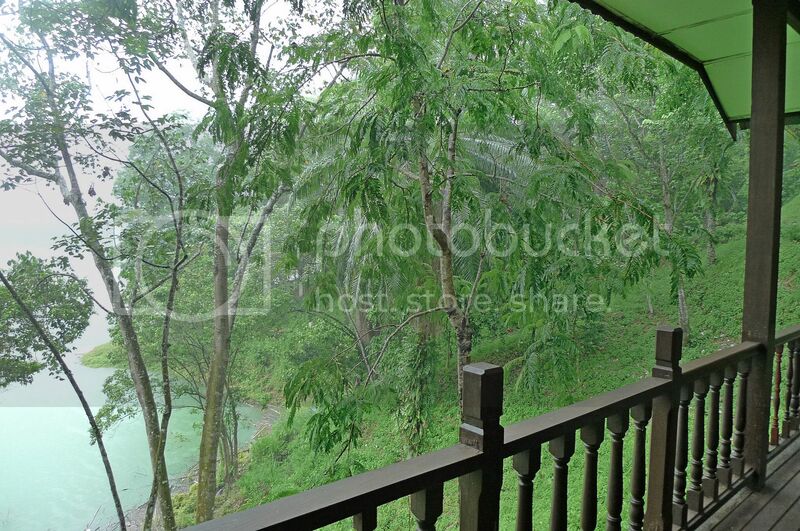 Prefer to sit on the balcony and enjoy the rain. More hairy legs in my upcoming posts, so be warned, haha! Wah, it the rain don't stop and my kids were there, they will get restless....I will go crazy when they become restless...ha ha ha! so relaxing and enjoying. let's go for a vacation together one day, foong. haha tweeting away while on vacay! Wah… every night, you burn RM45… expensive dinner! I prefer sing in a private room…. Cause I afraid all the stranger will run away! Ouh....so when you were in Kenyir it poured lar? Awww....it poured huh. I am sure you enjoyed every single moment of it right bro? Why didn't you play in the rain? very peaceful lake, i like rain and anything that is green. ayie, yeah, very relaxing vacation! 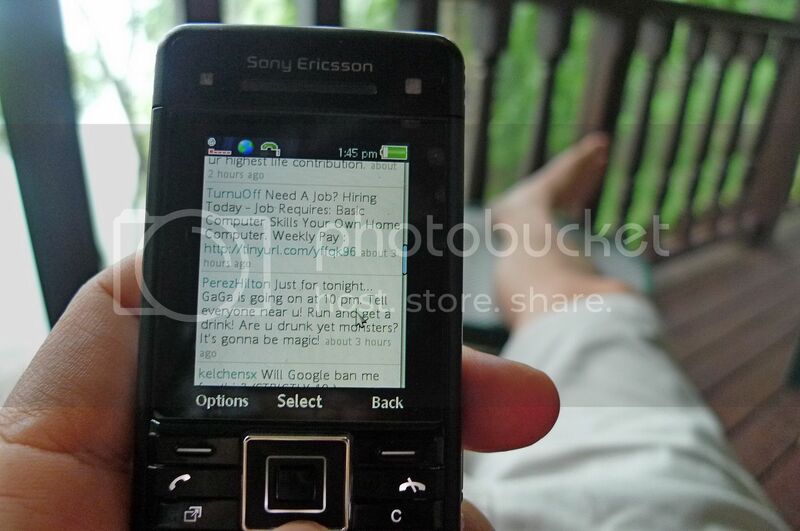 I love to tweet on my handphone! LOL! I also prefer to sing in a private room, haha. Actually it's nice to read a book at such a beautiful place! It's also nice to tweet. LOL! I showed my legs to compensate for not showing my face, hahaha! Beautiful Place to enjoy time !! Even i would love to see this place with my own eyes and for sure at the time of rain only !! Your toes are healing well! I just came back frm Pangkor island Foong! and the weather's so hot..
oh it rained one morning for abt 10 minutes only LOL! I love the sound of falling rain. It seems to be telling me something. 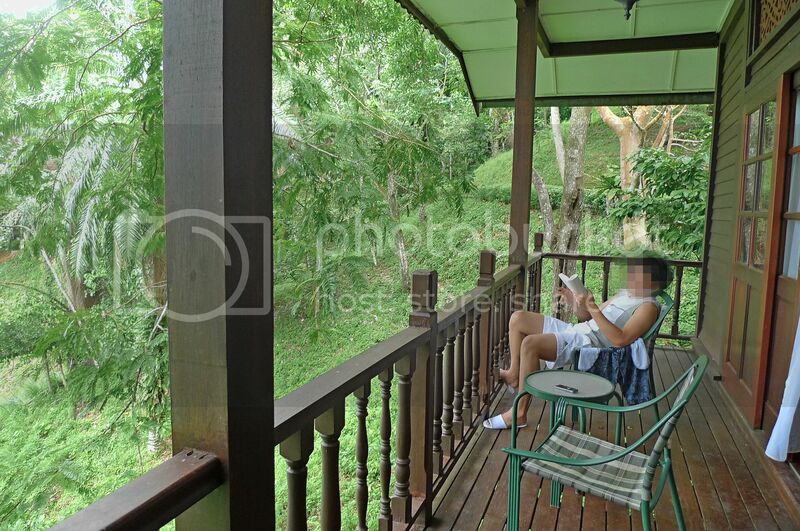 Can see the tranquility in your photos, wonder if it's infested with mosquitoes. Or do the mosquitoes get trapped in your leg hair? Ok, I know my jokes are lame. wah can still twitter in the jungle? so geng! shingo T, no the mosquitoes do not get trapped in my leg hairs, haha! No mosquitoes at that time fortunately soI enjoyed the rain totally, haha. What is the kenyir lake? 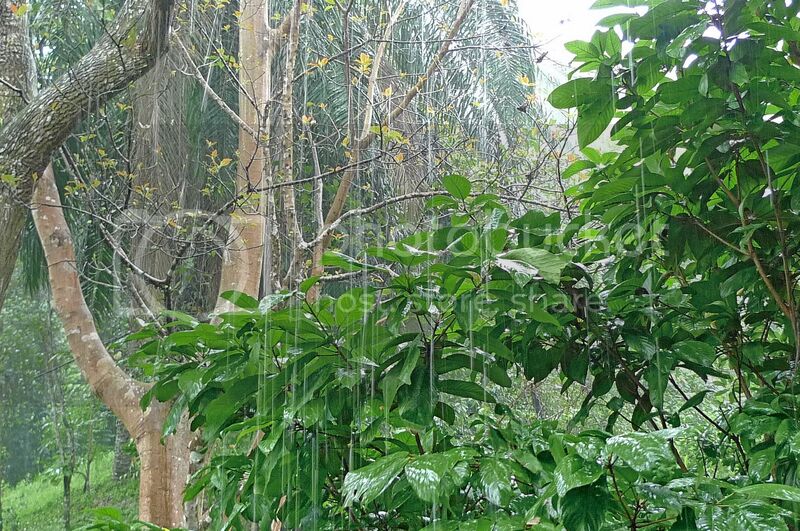 Well, nice pictures.I love rainy season.It's really amazing situation. wow! this is lovely.. :) i wanna go!